Western civilization is in the midst of a social mid life crisis. People are waking up with a desire to do more for the world and themselves. 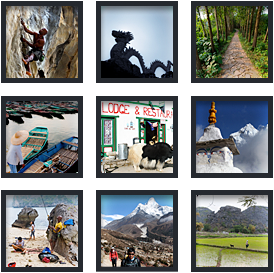 Adventure Activist provides everyone the opportunity to make a difference while having the adventure of a lifetime by taking volunteer projects around the world and pairing them with some of the most thrilling vacation packages available. Now you can get involved! Adventure Activist specializes in arranging travel packages that meet their clients schedule, budget, physical limitations and goals. Corporate programs are available with team building emphasis, branding options, geographic coverage and tax deductions. Professional photographer and videographer packages are available upon request. If you have an idea we can make it happen! Strengthen your legs and soul with a Kilimanjaro climb that benefits the local community. Together we build a sustainable garden or chicken coop for an orphanage in need of additional arable land, food and income. Finish off by taking the children on a thrilling safari. Exercising the body strengthens the mind, and not only your own. As you hang off a cliff face above pristine waters, kayak through a picturesque bay or trek through the jungle you'll be helping a child become a new student. Funds from your trip go towards tax deductible bike, rice and education donations.